In recognition of his significant research contributions to the representation and structure theory of finite groups and related structures. He has applied group theoretic and algebraic methods to investigate association schemes, whose theory serves as a unifying framework for the study of algebraic graphs, codes, designs and finite geometries. His published papers on multiplicity-free representations and characters, self-dual codes, spin models, group association schemes and Terwilliger algebras, as well as his tireless efforts to promote these research areas and mentor students have spurred the development of a core of young dynamic and productive mathematics researchers in the country today. 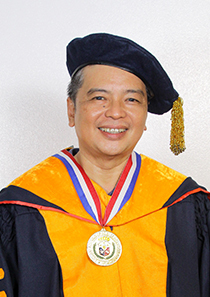 Recognized here and abroad, his leadership in the mathematics community is also manifested in his dedicated involvement in various initiatives to strengthen mathematics education and teacher competencies. Has continuously engaged in public service and extension programs, particularly teacher training and popularization of mathematics and science, and technical assistance to science and technology agencies and bodies.